Of the many inherent risks there are in being a writer, chief among them may be the tendency to try and make a good story better -- particularly when the tale involves the writer. Whether the embellishment was premeditated or accidental, the result often means that the writer is hidden under layers of fiction, making the process of analyzing their work and motivations a difficult if not impossible one. That reality likely stared Joan Reardon in the face when she decided to write a biography of Mary Frances Kennedy Fisher, chiefly known for her sublime contributions to the field of culinary writing. Fisher was a paradoxical mixture of someone who was private yet also never afraid to let truth get in the way of entertaining her audience or justifying herself. That nest of brambles resulted in Reardon's Poet of the Appetites: The Lives and Loves of M.F.K. Fisher, a not entirely satisfying story of a complicated woman's life. As Reardon illustrates, Fisher essentially invented the literary genre that she wrote in and she did it better than anyone else. Clifton Fadiman in an introduction to one of her books stated that Fisher wrote "about food as others do about love, only better." For Fisher, meals were meant to be sensuous, no less important to the human experience then the other accepted hallmarks of life. Although her best work concerned food, her books read like novels. Recipes were integrated into often times deeply personal stories chronicling Fisher's travels, her impressions of the locales she visited and lived in and thoughts on life and family. The beauty of her writing, which Fisher denigrated as hack work, masked what was largely a difficult life. She suffered from depression, was married three times -- one husband committed suicide after a lengthy illness, divorced twice, and involved in a number of troubled romantic relationships with men and women. She often medicated herself with food and alcohol. Her own children -- one illegitimate -- were often estranged from her, partly because of Fisher's frequent self-absorbed behavior, and also led difficult lives for decades including mental illness, drug abuse and failed relationships. And yet out of this tumult Fisher was able to write sparkling prose that celebrated life. Raised in a household that featured a grandmother that abhorred the pleasure that food could provide, Fisher spent her life documenting it. She wrote because she felt the urge to do it, yet the truth of what she wrote -- particularly about herself, her family and friends -- was often questionable. "While she was not the first culinary memoirist, she may well have been the first culinary confessionalists - or at least she portrayed herself that way," writes Reardon. Her nephew Sean summed her up by stating, "She told stories, sometimes rather well...she is much better on nostalgia, I think. Trouble is, she virtually embroiders the facts to the point where what she ends up with is virtually fiction." As thorough as Reardon is in documenting her life, the reader is left at the end with a vaguely unsatisfied feeling. Ultimately we know more about what meals Fisher served her constant stream of visitors then we do about made up this complicated woman and how she truly felt about major events in her life. To be sure, much of the reason for that is Fisher's, to employ a Hollywood buzzword, constant reimagining of her own life in her writing. Poet of the Appetites begs for some deeper insight into the mind of Fisher by Reardon -- even if entirely speculative -- but avoids that in favor of a straight documentary of her life. Despite that, Reardon does deserve praise for wading through Fisher's life and revealing aspects of her that were only known to her closest friends and confidantes. 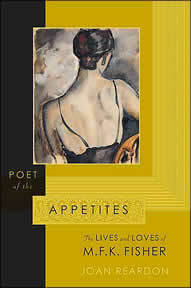 Although Poet of the Appetites would have been more successful had Reardon concentrated more of her efforts on analyzing Fisher's writing and the subject herself, it may also serve to prompt readers to go to the source and investigate the sensual world of Fisher's many works. Fisher may have hated reading her own work but few readers will share that feeling.